I just picked up 5 vintage wheels on the cheap. It was a great deal. 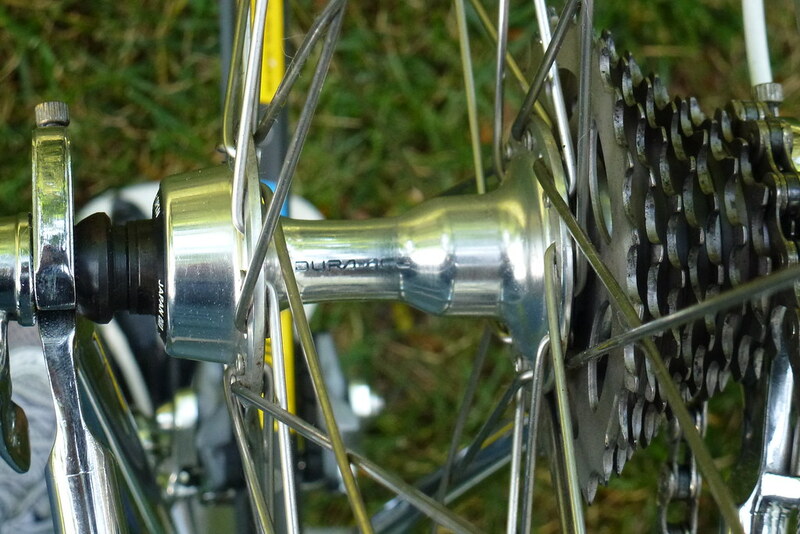 one set has high flange campy hubs. That's really what i was after. The odd wheel also has a 32hole GP4(my rear rim of choice)laced to a Dura Ace hub with a nice looking 8spd freewheel(TimTrial gearing, unfortunately). Being a campy guy, I've not seen such a hub. How long were these used? are they worth anything? After checking VeloBase, I don't think Dura Ace 8 speed freewheels were made. I think the first 8 speed was a cassette, CS-7400-8 after the 7 speed cassette offering. You might want to check it again. Pics would be nice and yes they have value, check the bay. I see you have a Montello as I do. Though I wish mine was all Campy, it is all DA 8 speed with the exception of the HS, post and pedals. BTW, I prefer Campy too, but this hub and this DA system is arguably equal too or better than the equivalent Campy performance. My Pin has DT shifters which suit me fine given the cost of brifters and the improved cabling aesthetics. Last edited by SJX426; 07-08-15 at 06:19 AM. That's an early 8 speed freehub, looks to be the one that takes only UG cogs but best way to tell is by removing the outer cog (you'll need two chain whips) and seeing if it has internalk threading on the end and one narrow gap for HG cogs.
. Ok, got ya. I'll need to run to the bike shop this weekend & grab another tool. Thank you! Yours does not look like mine so It could very well be a freewheel. I will let other contribute so I can learn with you. I think you're correct (7402 series). But I do see the "curved edge" locknuts, which I thought were only on the 7403 hubs. Last edited by Ex Pres; 07-08-15 at 07:08 AM. True. I'm basing my guess that it's a freehub on the 'bulge' on the drive side. Freewheel hubs have no similar bulge because the drive mechanism threads onto a stub machined on the outside of the hub. Also, the current UG cogs installed on the hub lead me to guess that it's an early UG only hub because 8 speed UG cog sets are pretty unusual compared to the number of HG ones out there. Why put UG cogs on a freehub if you can install superior (well, many think so, anyway) HG cogs on it? But removal and examination will tell the story. I am basing my retraction on further review of my album. I don't have a great picture of the locking configuration for the sprockets but this is the best I can do. 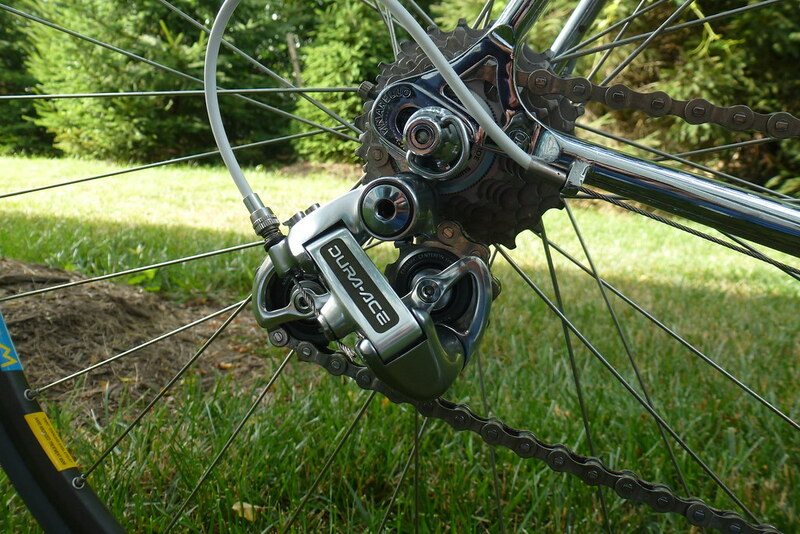 Note that the locking ring is not a sprocket. Ya hafta look past the DO! The plot thickens.... Maybe I'll run it into town tomorrow & have it removed. That is definitely a freehub, impossible to tell if Uniglide or UG/HG without spinning off that top sprocket. If I had to guess, I'd say UG only. Heck, just send me the wheel. I'm not opposed to trades that include the name "Campagnolo"
agreed. It's a freehub and I am almost positive it is an UG only one, it's clear from the site shot it will only take a threaded lock cog and not a lockring. Definitely UG and I don't see any internal threads so I would say UG only. I've got the same setup. Is there an Ishiwata framed Raleigh?